Yesterday was the last time I will ever see these pairs of matching socks together. My beloved socks were too worn out to repair and have gone on to sockie heaven. I do have new socks. These socks taught me a lot, but I don’t think I’m going to be wearing them very often. 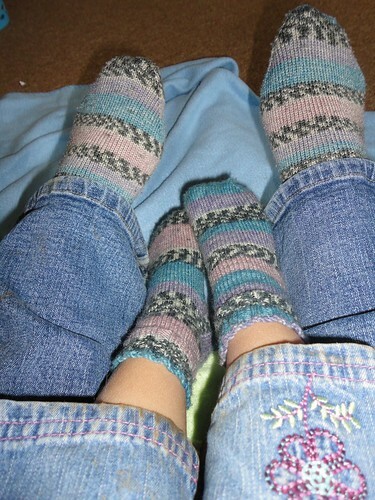 It was my first attempt at two at a time, toe-up construction and I made the heel a bit too long for my comfort. 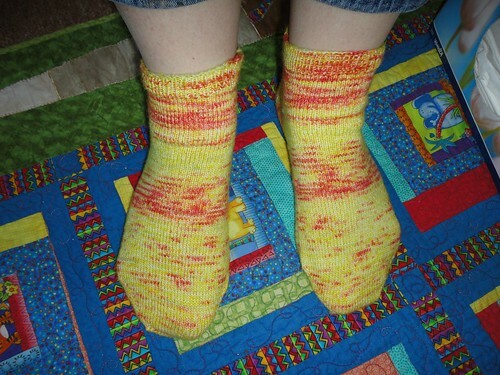 These were from a sock blank and that was lots of fun. 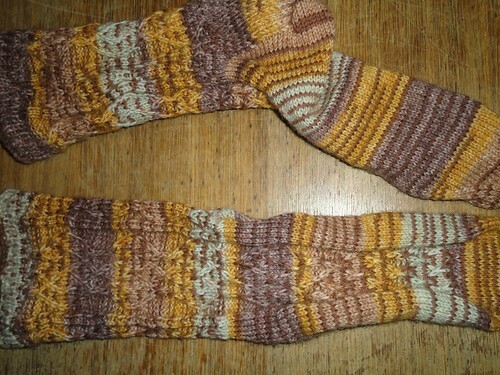 I think I need to find a source of dyed sock blanks! 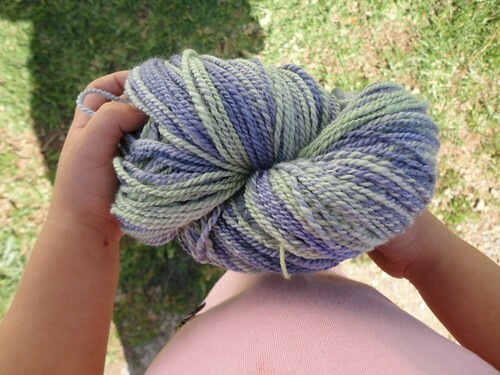 I’ve been doing some custom spinning. 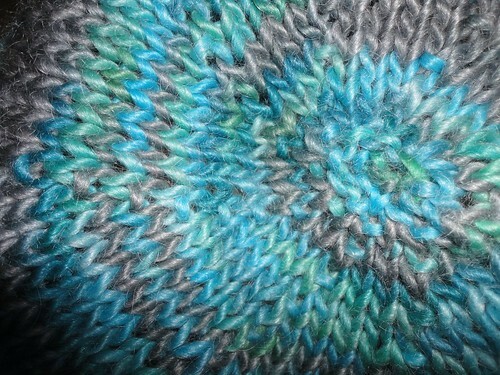 This is going to be knitted into a shop sample. The colours are better in this picture. 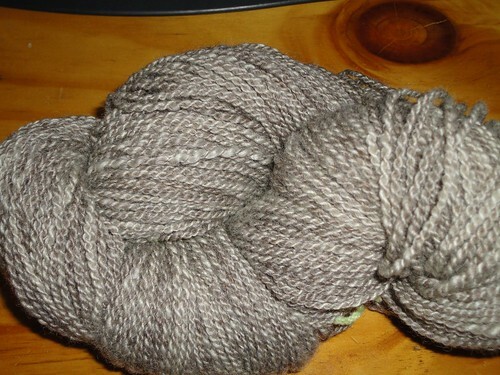 The second skein of this is being spun at the moment, it will stay in its yarn form so that people can see what the fibre looks like spun up. 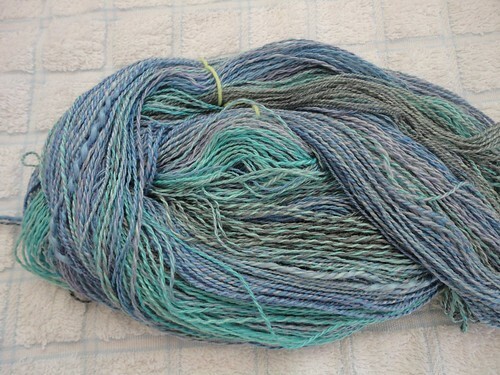 The fibre is 100% tussah silk. My mother-in-law and step-father-in-law arrived last night for a visit. So things are going to get more hectic for a while, hopefully I’ll still be able to fit some crafting in. This is making me happy at the moment. This little garden bed sits outside our back door (which is really our front door because we never use the front door) and I see it every time I leave the house. 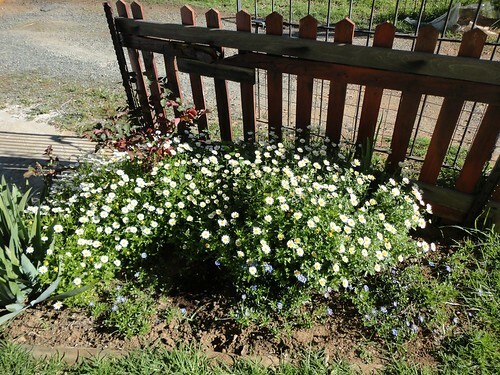 Last year we planted 5 white daisy plants. This year the mass of daisies came up by themselves. 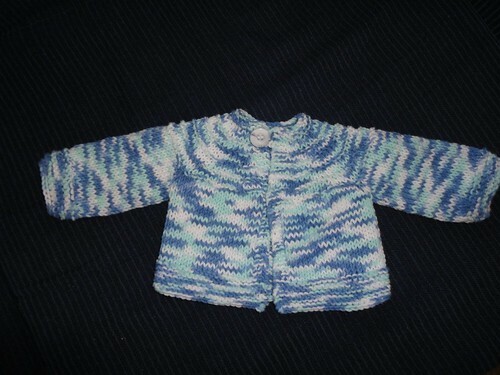 I finished up this cute little cardigan. I also finished something for me. 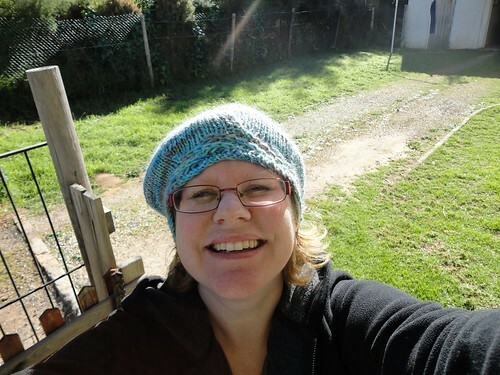 I’m not really a hat person, but when I saw the sample and the yarn for sale at Nurturing Fibres gallery I decided to cast on. Carle taught me magic loop on this one and helped me correct my seeming inability to count. It’ not as floppy as it should be, but I’m happy with it. Gorgeous Girl says it’s pretty and Gorgeous Man is not quite as enthusiastic. With my helper. (He lay down on it just after I snapped this). 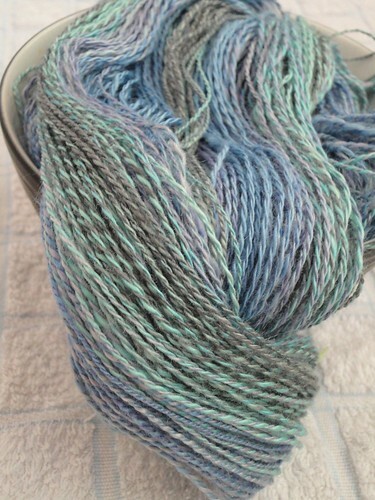 Dyed and spun by me. Well, Gorgeous Girl is at school and I have a few hours to myself. I’m going to read a few blogs. 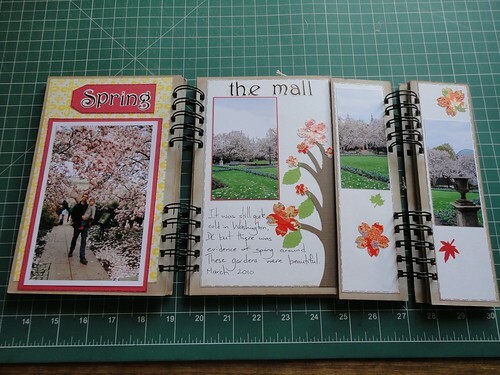 I’m woefully behind, and then attach the binding to my quilt. Thank you for all your kind words regarding our break-in. Life has been a little hectic here with police and finger-printing teams (they did turn up a day after they said they would, and found nothing). Then there were the workmen who came to repair the broken windows and bent burglar bars. So, we have new (stronger) security bars on all of the windows that are accessible from the ground. We have a one storey house, but it’s on a hill so the front windows are only reached with a ladder. Speaking of school. 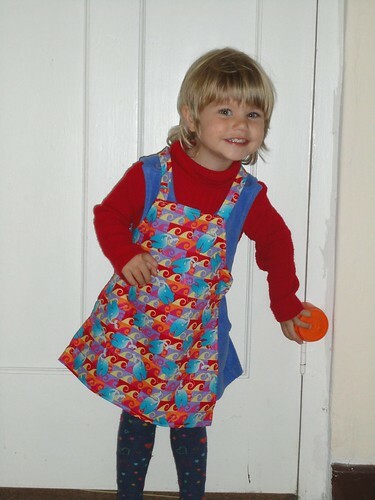 Last week the teacher told me she needed an apron for ‘kitchen time’. The kids wash their own plates after snack time. So Gorgeous Girl and I went stash diving and she chose the fabric to make this. I’m really pleased with how it turned out. I simply traced around the front of one of her dresses and then flattened the top of the dress and deepened the arms. Then folded the fabric in half and cut it out (to get both sides symetrical). A long time ago (April) we went on a work-trip/holiday. 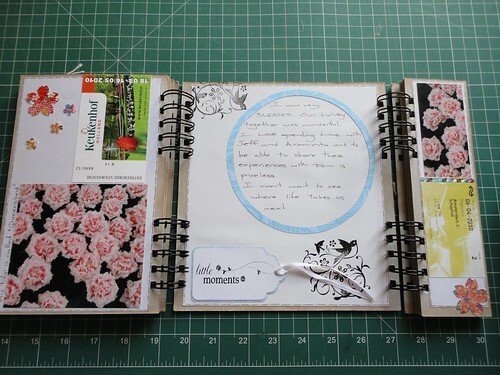 The travel journal I made before I left has been completed for some time. Here are my two favourite layouts. This is in Washington DC. This from Amsterdam and the final page. 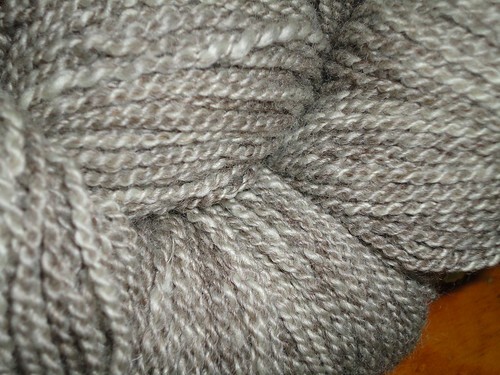 I also finished up this yarn a while ago, and only just got around to photographing it recently. This was my first time spinning Blue Faced Leicester. It was wonderful. 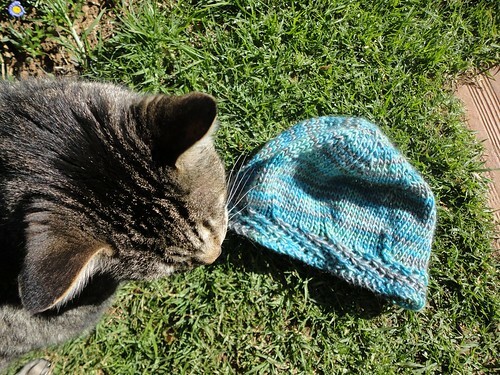 And this last bit of knitting has been months in the making. Because of the slipped stitches and tricky charts I could only do this when a certain young lady was asleep or otherwise occupied.